For the last 17 it has been an honor to invest in the next generation through ministry training in the Assemblies of God Bible Institute – now called Theological Seminary – in San José, Costa Rica. We have watched the culture evolve in many areas, but recently the influence of technology has become an absolute game-changer in the lives of our students. I find myself trying to wrap my brain around the new reality of teaching ministry students who carry a world of information in their smart phones, take photos instead of writing, crave “likes” and comments, see customized news and ads based on their online habits, and maintain nonstop social media conversations with their friends around the world. My cogitations led me, of course, to search for relevant articles from respectable sources online, interview some real, live teachers in our national School of Youth Ministry, and (what else?) conduct a Facebook survey of my tech-savvy missionary educator friends around the world. 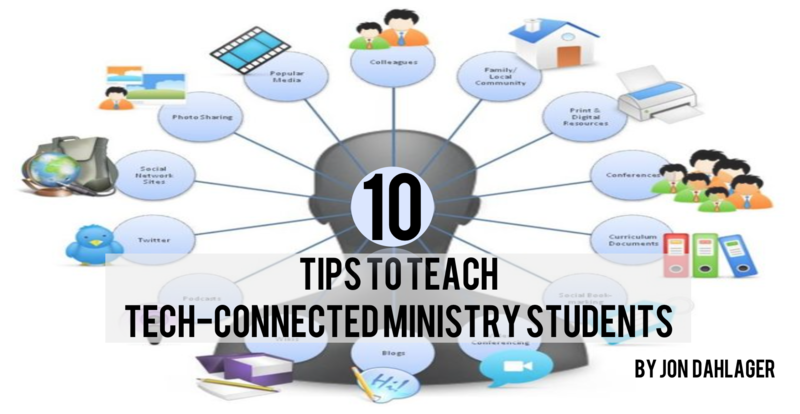 I offer these 10 suggestions for more effective ministry training to our tech-connected students. 1. Take advantage of instant information. “Googling” has now become a verb even in Spanish, “googlear,” and on one hand it means teachers can no longer make up information and hope students won’t notice. On the other hand, there is no limit to the information available to us in the classroom, whether or not there are any physical library books at hand. Take advantage of this new “instant research” capability to create study groups or assign previous digital reading so students come ready to work in class. Students can read from multiple Bible versions instantly, find cross-references without a Thompson-chain hardcover on the table, and look up mystery words in a heartbeat. If the professor is brave enough to say “I don’t know…somebody look it up,” the whole group can participate and get smarter together. One caveat on electronics in the classroom: many profs are discouraging students from taking class notes on laptops, as the distractions can be overwhelming, and writing by hand makes the brain slow down and actually process information better. 2. Share digital resources. The new information-sharing culture means that students don’t want the professor to be the “sage on the stage,” the absolute authority who has information not available to the students. The teacher is a tour guide to take the students over a bridge into a new world of unknown topics and resources. In a blasé class the students get a rehash of the assigned chapter in the textbook. In a good class the professor anticipates questions and explains other perspectives. Share good electronic books and articles when copyright permits – you will find that many students are already growing their own collections. 3. Help them love the topic. They can get information online or through a correspondence class, but passion is contagious, and the professor is the carrier. Soak in your subject until you love its taste and its importance beats in your heart. Your students have grown up watching TV programs with characters passionate about cake decoration, European soccer, pop music, or mega-constructions. It is your job to show them the joy of discovering the treasures in the Bible and learning to shine God’s truth into this darkened world. 4. Teach critical thinking. This does not mean criticizing others, but teaching students to distinguish between the different qualities of information they will find in the river of online resources. Critical thinking is the difference between googling a topic and actually doing college-level academic research. When we find an online source we have to ask some questions: Who is writing this? What is their purpose or agenda? Who is sponsoring this web site? Do they cite other sources? Is it peer-reviewed? Is it a primary source with original material, a secondary academic compilation, or a tertiary dictionary-style source? We can teach them how to read popular sites like Wikipedia as an introduction to a topic, then use its footnotes to find more original and trustworthy information. 5. Assign practical real-world activities. Students spend so much of their time in the virtual world that in class they want to learn new practical skills and try their hand at them. Don’t leave them hanging with dry theory. When teaching the Psalms, get them singing. In a counseling class, invite a guest willing to share personal struggles and victories. Take your missions class to get to know an unreached people group. Let them squeeze the bread dough between their fingers, so to speak. They can’t do that on their smart phone. 6.Offer timely feedback. In a social media world where people obsessively count every like and where positive comments and shares are treasured like gold, students crave the professor’s timely feedback. Grade their projects and return them with comments that let them know you actually read what they worked so hard to produce. On the flip side, electronic communication, and especially chat groups, can turn into a class meeting that never ends, so you might want to put time boundaries around the professor’s availability and define appropriate formal vs. informal class-related communication. 7. Design plagiarism-resistant assignments. The practice of “copy and paste,” copying information from a digital source and inserting it unchanged into one’s work, not only is common with Latin students, but for some it is the only way they have ever done school projects. Instead of giving vague assignment instructions like “write a research project on X topic,” it is better to assign specific questions to answer so they learn the appropriate use of information and actually have to develop their own personal reflections on the topic. Teach them to cite resources with tools like SEC’s Guía de Formato de Monografías. 8. Use good design and electronic media. These students live in a world of videos, photos, crisp graphic design, phone applications, and digital communication. In their high schools and universities they turn in assignments online, interact with fellow students in chat groups, and watch and create videos. One easy and practical way to use media is to create student groups in Whatsapp to share information, to interact with topics, upload resources, and even turn in assignments. For the record, Power Points full of text for lectures do not impress this generation, and may even be counterproductive if they are not well designed. Visuals should complement class content, but the entire content of the lecture need not be on the screen. 9. Communicate clear expectations. It takes planning to organize class readings, assignments, tests and projects with enough clarity that students understand what the teacher expects. It is stressful for students when the prof is indecisive or grades based on criteria that were not well explained. If ALL of my students get a bad grade on a test or project it is MY fault, because it is apparent that I set them up for failure. One of the biggest classroom planning challenges relates to group projects that require work together outside of class. My resources for this piece disagreed on whether today’s electronically connected young people do or do not prefer these projects. Two observations seemed universal, though. 1. For introverts group projects can be highly stressful, and we may want to give them the option of working alone. 2. For group project grading to feel fair, the teacher should have a way to evaluate the contribution of each team member. No one ever likes it when the slacker in the group gets the same grade as the person who put it all together. 10. Demonstrate loving apologetics. In a pluralistic, tolerant world that insists that truth is relative for each person, young people need to see Christians who are able to defend the absolute truth of God with logic and kindness. The church does not need more angry voices cursing the darkness. The words of the apostle Peter still ring true, “Always be prepared to give an answer to everyone who asks you to give the reason for the hope that you have. But do this with gentleness and respect” (1 Pet. 3:15). Let us raise up a generation of men and women of God, filled with the Holy Spirit and given the tools to teach and defend the truth in a spirit of grace. Thanks Jon! This was a very encouraging and pratical article for those who interact regularly with students and technology. I appreciate the suggestions and look forward to incorporating a few as I review my classes for the upcoming semester. Excelent article, Jon. It should be translated into Spanish. Thanks, David! Our students can be full-tech or almost no-tech. Lord, help us to meet them all where they are at. Jon – I’ve been cogitating what you’ve written, kneading it around in my brain, and I am edified. Well done!